*Please access the Oklahoma film Enhancement Rebate Guidelines for detailed information about the Oklahoma Film Enhancement Rebate Program. Is the Oklahoma Film Enhancement Rebate Program a tax credit or a cash rebate? The Oklahoma Film Enhancement Rebate is a cash rebate on qualifying Oklahoma expenditures. Is there a cap for the Oklahoma Film Enhancement Rebate Program? Yes, the Oklahoma Film Enhancement Rebate Program is capped at $4 million per fiscal year (July 1-June 30), but due to the rolling cap, the queue is always open and applications may be accepted at any time. Is there a sunset date for the Oklahoma Film Enhancement Rebate Program? The Oklahoma Film Enhancement Rebate Program‘s sunset date is July 1, 2024. Do I have to show proof of funding? To utilize the Oklahoma Film Enhancement Rebate Program, projects are required to show proof that 100% funding is in place 30 days prior to start of principal photography. For other funding benchmarks, please visit the incentives page for the Oklahoma Film Enhancement Rebate Program Guidelines. Do commercials, documentaries or TV series qualify for the Oklahoma Film Enhancement Rebate Program? Yes, if they meet the eligibility requirements. Please visit the incentives page for more information. What if I take Oklahoma crew to another state to work on the same production? Only payments or wages for work completed in Oklahoma will qualify for the rebate. Is there an application fee for the Oklahoma Film Enhancement Rebate Program? There is no application fee at this time. What are the eligibility requirements for the Oklahoma Film Enhancement Rebate Program? Film and television productions, as well as television commercials with national advertising messages that are broadcast on a national affiliate or cable network (as defined in Oklahoma Statute, Title 68 § 3621-24 Item 6A), filming in the state of Oklahoma with a minimum budget of Fifty Thousand Dollars ($50,000) and spending at least Twenty-five Thousand Dollars ($25,000) in Oklahoma, are eligible to apply for the Oklahoma Film Enhancement Rebate Program. Must a certain percentage of crew be Oklahoma residents? Do wages paid to non-Oklahoma residents qualify? Yes, but only if the wages are paid to a below-the-line Oklahoma Expatriate crew member. Oklahoma Expatriates are former residents of Oklahoma. For more information about the Oklahoma Expatriate Provision, please visit the Expat Terms of Service or email Yousef Kazemi. Are there any sales tax exemptions? Yes, Oklahoma also offers a Point of Purchase Sales Tax Exemption. Please visit our incentives page for more information. PLEASE NOTE: This Point of Purchase Sales Tax Exemption cannot be used in conjunction with the Oklahoma Film Enhancement Rebate Program. Which production costs qualify for the Oklahoma Film Enhancement Rebate Program? A list of qualified Oklahoma expenditures can be found on the incentives page. Does the Oklahoma Film Enhancement Rebate Program require an audit or review? Yes, a third party CPA must conduct agreed upon procedures for every rebate project. For a list of CPA’s, please visit the Oklahoma Production Directory. Does the Oklahoma Film Enhancement Rebate Program apply to above-the-line compensation expenditures? Yes. No more than twenty-five percent (25%) of your total qualifying Oklahoma spend can be comprised of aggregate qualifying above-the-line payments. Does the Oklahoma Film Enhancement Rebate Program apply to video game production? I just found out about the Oklahoma Film Enhancement Rebate Program and I have nearly completed my film. Can I still apply? No, retroactive applications will not be accepted. If I don’t qualify for the Oklahoma Film Enhancement Rebate Program, can OF+MO still help me? Yes, OF+MO offers a variety of services, including locations assistance, community liaising, posting casting or crew calls and promoting Oklahoma-made films that have completed production. I want to work in the film industry and have no experience. How do I get started? Career, volunteer and internship opportunities exist within many of the state’s arts-centered organizations, events and festivals, which we often list on our jobs and internships pages. You may also register in the Oklahoma Production Directory as an intern in order to gain on-set experience. OF+MO periodically accepts intern applications as well. In addition, it may be beneficial to browse our listing of film resources and attend our networking and mentoring events throughout the year. For more information about film events in Oklahoma, please visit our events calendar and subscribe to our e-mail notifications and monthly newsletter, Now Playing. How can I network with other Oklahoma creative media professionals? Networking is crucial to connect with our state’s creative media professionals. Suggested opportunities include exploring local social media networking groups, film and music festivals and OF+MO sponsored events. Career, volunteer and internship opportunities exist within many of the state’s arts-centered organizations, events and festivals. For more information about these opportunities, please visit our jobs and internships pages, browse our list of film resources and subscribe to our e-blasts and monthly newsletter, Now Playing. How can I be cast in a movie or T.V. show? OF+MO provides casting calls on our jobs page. The majority of casting in the state is done through talent and casting agencies. Please visit our Production Directory for a list of those agencies as they will have the most updated information on available casting opportunities in the state. Where can I get a list of talent agents? Please visit the Oklahoma Production Directory to search for more information on local talent agencies or contact Yousef Kazemi. Distribution is one of the largest hurdles for independent filmmakers. The Oklahoma Production Directory offers information on local distribution companies. Submitting your film to festivals is a great way to showcase your work to audiences and film industry professionals including distributors. Prestigious international film festivals like Sundance, South by Southwest and Tribeca provide great platforms for distribution. Local film festivals like deadCENTER Film Festival also provide filmmakers with distribution workshops and opportunities. With the rise in streaming services like Netflix and Amazon, the distribution model is rapidly changing. How does OF+MO assist with location scouting? OF+MO can arrange for a physical location scout to locations within the state on a case-by-case basis; however, we do not provide monetary travel compensations for productions. The fastest and most effective method to explore Oklahoma’s diverse locations is by accessing our online database, the Oklahoma Locations Directory. Users of the directory can explore thousands of photo galleries highlighting potential filming destinations across the state’s 12 different eco-regions. Inquiries about specific filming locations can be sent to OF+MO via e-mail correspondence through the directory. How can I have my property used in a film? OF+MO is continuously seeking locations to populate our online database, the Oklahoma Locations Directory. Sharing your property for potential use in a film production is a fairly streamlined process. Simply scout your location (take photographs) and OF+MO can create a customized login whereby you can upload your photos directly to our database. Alternative methods of submitting location photos can be arranged on a case-by-case basis. For questions about sharing your location, please contact Yousef Kazemi. I need rural locations for my production. Can I still base out of a larger city? Rural locations can be found widespread across the state. The two largest cities in Oklahoma – Oklahoma City and Tulsa – often provide the most infrastructure and crew support for film, television and music productions, though other cities can also accommodate film productions. For more information, please contact Yousef Kazemi. Where can I find information about production services? Please visit the Oklahoma Production Directory for information about production services or contact Yousef Kazemi for further questions. Is there experienced film crew in Oklahoma? Yes, Oklahoma has experienced crew and support services, which are listed in the Oklahoma Production Directory. Currently, our industry is about 2-3 crews deep, however, OF+MO offers an additional layer of crew through our expatriate roster upon request. Expatriates are Oklahoma natives currently working in the film industry who are based outside of Oklahoma. For more information about Oklahoma expatriates or to register as an expatriate, please visit the Oklahoma Production Directory or email Yousef Kazemi. Where is the film crew located in the state? Most of our film crews are located in the state’s two largest cities, Oklahoma City and Tulsa; however, many of our crew members are willing to work statewide and have experience working in both urban and rural communities. How can I get the word out about my company? Registering in the Oklahoma Production Directory is the best way to promote your business to the state’s film, television and music industries. The Oklahoma Production Directory is an online database which allows our local industry crew members and film-friendly businesses to register their trades and services to be considered for employment by film and television productions working in Oklahoma. Registrants in the directory can upload their contact information, credits, resumés and more. The directory is a free service offered by OF+MO to promote jobs creation and economic development within the film and music industries. **OF+MO promotes the Production Directory equally to all productions and does not give recommendations for any individuals or entity. What are some of the benefits to filming in Oklahoma? Oklahoma offers one of the highest cash rebate percentages in the nation at 35%. An additional 2% can be obtained by utilizing music that was produced or recorded in Oklahoma, and with a low minimum spend of only $50K (at least $25K of which must be local spend), even small independent films will find the Oklahoma Film Enhancement Rebate easily accessible. There are no caps for how much a single project may obtain in rebates, however, the program has an annual cap of $4 million, distributed on a first-come, first-served basis. An extremely wide breadth of filming locations can be found among Oklahoma’s 12 eco-regions, with everything from the trademark great plains and sweeping prairies to the unexpected lush forest, expansive plateaus and sand dunes. For any project coming to the state, film-friendly Oklahoma businesses are eager to offer up heartland hospitality to productions, big and small. These film-friendly elements combined with the low cost of living and favorable economy make Oklahoma a prime destination for your next film, television or music production. How do I find out about productions that are currently filming in Oklahoma? For a list of productions that have been pre-qualified for the Oklahoma Film Enhancement Rebate Program, including their tentative dates of filming, please visit our rebate queue. 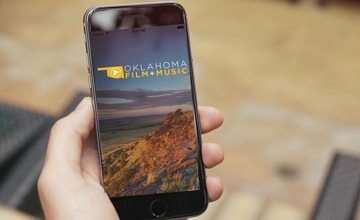 You may also subscribe to our e-mail notifications and monthly newsletter, Now Playing, for more information on film and music news and events in Oklahoma. Does OF+MO have stock footage of Oklahoma? OF+MO does not have stock footage available, however, many of our state’s production companies do offer this service. Please visit the Oklahoma Production Directory for a listing of applicable companies and their contact information. Do I have to get permission to film in Oklahoma? Yes, all productions filming in Oklahoma should obtain permission from their respective filming locations prior to the start of production. Permission to film on private properties must be agreed upon by the production and property owner. Properties and locations maintained by city, state, government or other municipalities require permission from their governing agency. For information about permitting, please visit our film resources page or email Yousef Kazemi for more information. Do I need a new permit for each filming location? Most locations will require individual permits and location agreements per location. Oklahoma does not currently offer “blanket” permits which allow a production to film across an entire city or region. For information about permitting, please visit our film resources page or email Yousef Kazemi for more information. How much does it cost to film on state property? Rates for filming on state property are dependent upon the impact of your production on the requested location including, but not limited to, the requested date/time of your filming, cast/crew size, equipment load and required special assistance, such as closures, traffic control and added on-site security or personnel. If my shoot requires pyrotechnics, who do I contact? Please contact your jurisdiction’s local fire department or city services office for production activity involving pyrotechnic elements. For further assistance, you may contact Yousef Kazemi. If my shoot requires traffic control, who do I contact? Please contact your jurisdiction’s local police department or city services office for traffic control and special assistance on roadways. For further assistance, you may contact Yousef Kazemi. Where can I find information on Oklahoma child labor laws? Information on child labor laws pertaining to the entertainment industry can be found in the Labor Laws and Organizations sections of our film resources page. You may also contact the Oklahoma Department of Labor for more information. Do I have to have insurance to film in Oklahoma? The State of Oklahoma does not require film productions to carry insurance. However, films utilizing the Oklahoma Film Enhancement Rebate Program administered by OF+MO must meet specific insurance requirements as mandated by the guidelines of the program without exception. Film productions are strongly advised to have insurance policies in place to ensure the safety of cast, crew and locations while filming in Oklahoma – and many of these parties will prohibit filming and/or their involvement with the production without a policy in place. Is Oklahoma union or right to work? Oklahoma is a right-to-work state. What is the weather like in Oklahoma? Oklahoma has a wide range of weather patterns which allow for filming in any season. With a generally temperate climate, the statewide average temperature is 60 degrees, but temperatures may dip below zero in the winter and soar above 100 in the summer. While the east and south are more humid, the west is dry. Rainfall varies from 15 inches in the northwest to more than 50 inches in the southeast. Statewide annual precipitation is 33.79 inches. Snowfalls, ranging from two inches a year in the southeast to 25 inches in the northwest, rarely remain on the ground for more than a few days. For customized weather forecasts during filming please contact the National Weather Service. What is the nightlife like in Oklahoma? With countless venues and events throughout the state, there is always something to do in Oklahoma! We offer an events calendar on our website with numerous film and music events in the state. In addition, Oklahoma has over 125 film and music festivals, Oklahoma City Thunder basketball, the Oklahoma Dodgers and Tulsa Drillers baseball and many concerts throughout the year at the Bank of Oklahoma Center in Tulsa or Chesapeake Event Center in Oklahoma City. The TravelOK.com events calendar provides a comprehensive list of statewide events of all types. I want to work in the music industry and have no experience. How do I get started? Aside from developing your performance or Music Business skills, networking is crucial to connect with our state’s creative media professionals. OF+MO suggests exploring local social media networking groups and attending music events throughout the state. Opportunities exist within many of the local arts-centered organizations listed on our music resources page as well as our jobs and internships pages. In addition, please subscribe to our e-blasts and monthly newsletter, Now Playing, to keep up with the latest film + music news and learn about networking + mentoring opportunities throughout the state. I am an artist. How can I book more gigs in Oklahoma? There is no single way for artists to book gigs in Oklahoma, though networking and self-promotion are key elements in this process. In addition to the suggestions above, we recommend registration in the music talent category in the Oklahoma Music Directory. Additionally, you may search the Oklahoma Music Directory’s music business categories for booking agents to assist you or contact venues to find out more. OF+MO also lists several open calls for music events throughout the year. How can I get my music in a film or television show? There is no single way to have your music licensed for film and television, however, OF+MO hosts the Oklahoma Music Directory, a FREE online datebase. Films utilizing the Oklahoma Film Enhancement Rebate Program can earn an extra 2% cash rebate for using music that was produced or recorded in Oklahoma, and the Oklahoma Music Directory is the only official listing of Oklahoma music talent and music businesses. You can also access our rebate queue for a list of current projects filming in Oklahoma. We encourage you to attend our networking events and local film festivals to meet filmmakers who have the potential of using Oklahoma music. Do I need a permit to have a music festival in Oklahoma? Yes. There are multiple permits that may be required depending on the type of event you are looking to host, including noise permits and alcohol permits. Please review our music permitting page for more details. How can I let musicians know about my Music Business? OF+MO hosts the Oklahoma Music Directory, the state’s official listing of music talent and music businesses. Be sure to register so people can find you as a resource. I am looking for Oklahoma talent for my music event. Can you help me? OF+MO hosts the Oklahoma Music Directory, the state’s official listing of music talent and music businesses. You can use this directory to browse talent listings by genre or location. What services does OF+MO provide the film and music industries? Film: The Oklahoma Film + Music Office (OF+MO) strives to support and connect local, national and international filmmakers with Oklahoma’s skilled crew, talent, production services and diverse locations which span across 12 eco-regions. OF+MO administers the Oklahoma Film Enhancement Rebate Program and connects filmmakers to a variety of local resources, including location portfolios, location permitting, local crew and support services via our online Locations Directory and Production Directory. If you have a film festival or screening, OF+MO can promote your event on our events calendar and consider it for social media postings. We can also announce your open call for entries as well as any crew and casting/extras calls. Music: OF+MO promotes and showcases Oklahoma’s rich musical heritage and connects emerging artists of all genres to music venues and businesses across the state with the Oklahoma Music Directory. If you have a music festival or event, OF+MO can promote your event on our events calendar and consider for social media postings. We can also host or announce your open call for entries. Our purpose is to grow the film and music industries statewide. OF+MO is a state agency within the Oklahoma Department of Tourism and Recreation, which receives funding from the State of Oklahoma and is governed by the Oklahoma Tourism Commission. What is the difference between OF+MO and the Tulsa Office of Film, Music, Arts and Culture? OF+MO is the state agency tasked with managing the Oklahoma Film Enhancement Rebate Program and supporting the film and music industries on a statewide level. The Tulsa Office of Film, Music, Arts & Culture provides resources to further grow, develop and enhance the Tulsa Region’s creative industries including film, music and arts, all while promoting Tulsa as a creative hub and cultural destination for these industries. How can I submit an event for the online events calendar hosted by OF+MO? To have your event added to our events calendar, simply send a message to our Communications + Music Coordinator, Katie Lovasz, giving all the details of the event including the title of the event, URL, address, city, zip code, cost and any age restrictions. Can OF+MO help me find an industry job? OF+MO provides a listing of jobs including cast and crew calls, internships and volunteer opportunities. We also list call for entries for film and music festivals and events. Additionally, we host the Oklahoma Production Directory and the Oklahoma Music Directory where local talent can register for FREE so that they can be located by those looking to fill positions in their next film or music project. How can I get an internship with OF+MO? OF+MO offers internship opportunities year round where interns have a chance to learn how the state supports the film and music industries while assisting the office with day-to-day tasks. Please check our jobs and internships pages for updates and details. Are there any film school programs in our region? Yes, please visit our film resources and music resources pages for a list of film and music programs Oklahoma colleges and universities.